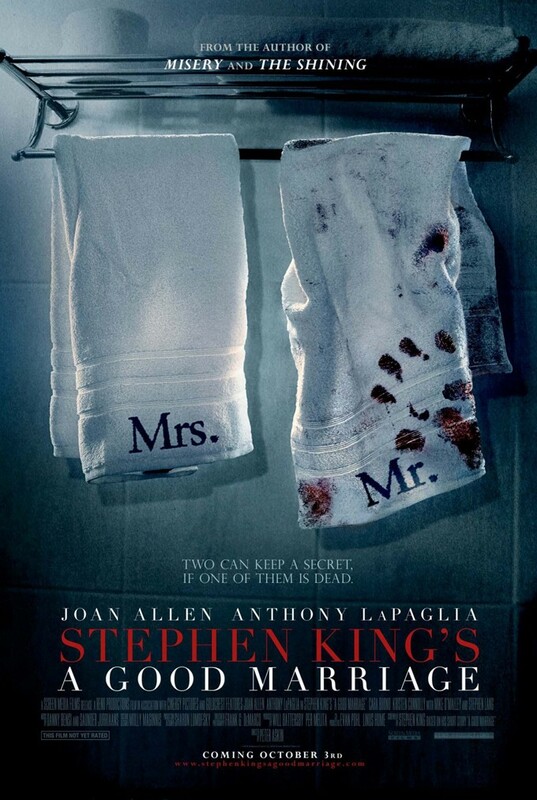 Trailer for New Stephen King Thriller, A GOOD MARRIAGE! We've got a new Stephen King flick headed our way! And unlike the forever stalled adaptations of THE DARK TOWER or THE STAND, it is filmed and has a release date! A GOOD MARRIAGE tells the story of a happily-married middle-aged couple who have spent a seemingly perfect life together. Until one day when the wife, played by Joan Allen, finds evidence indicating that her husband (Anthony LaPaglia) is a noted serial killer whose crimes have gone unpunished for years. The script (written by King), is based on a novella that was part of his FULL DARK, NO STARS collection. The book as a whole is fantastic, and this story in particular made good use of suspense as the woman puts the pieces together and decides what to do with this horrifying information. I'm hoping that this aspect is carried over into the film, as it could build toward some wonderfully tense moments. The film co-stars Kristen Connolly and Stephen Lang, and is slated for release on October 3rd. What do you guys think?